America's largest outdoor Steampunk festival! Visit our 2018 schedule for a taste of what 2019 might have in store! The original festival was a one-day event held inside the Charles River Museum of Industry and Innovation, under director Elln Hagney. It was intended to be a fundraiser for the Museum, which had suffered damage from flooding by the Charles River. Around 400 people were expected; over 1000 showed up! 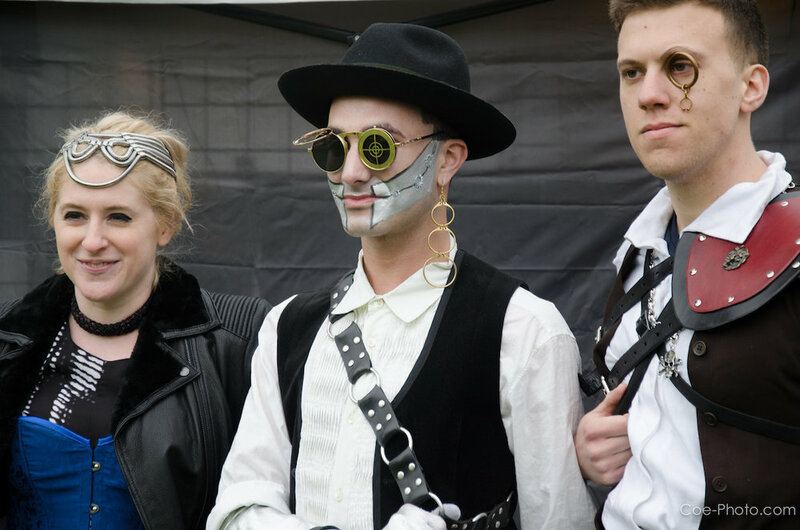 This was the first year the festival moved outside and became a two-day event, under the name “International Steampunk City.” Some events were held in the Waltham Watch Factory building; other events were held on Waltham Common and in the CRMII. The festival was renamed the Watch City Festival, based on Waltham’s traditional nickname. The plotline involved an election for Mayor of Watch City; the candidates were Edward von Arkham, Redfield, the Baron von Lahey, Emperor Justinian of the Red Fork Empire, and Rupert Cornelius the Educated Ape, and the winner was the Baron von Lahey. This year we celebrated the 200th anniversary of the creation of the mill buildings in Waltham by industrialist Francis Cabot Lowell. The plotline involved an actor playing Lowell as if he had been brought forward in time to see modern Waltham, but the plans for the factory were stolen and had to be found and returned by the end of the weekend or else the timeline could be changed permanently! Our other special guests were author and artist James Gurney, creator of “Dinotopia,” and Mike Zohn and Evan Michelson from the TV show “Oddities”. Elln Hagney left the CRMII, and the new director decided that she was not able to run the Festival and the Museum at the same time. The Festival was turned over to the Downtown Waltham Partnership, a local organization which seeks to improve Waltham’s downtown area and give people reasons to visit Waltham. Unfortunately the DWP was unable to get the Festival organized that year. However, they started to hear that people really did miss having the Festival, and were determined to bring it back to Waltham. Bob Perry, a member of the Downtown Waltham Partnership, was recruited to head up the relaunched Festival. Several members of the old Festival committee returned as advisors. The Festival became a one-day event, and it was a great success, featuring a “War of the Currents” between Captain von Arkham’s Tesla Tower and snake oil salesman Solomon Sedgewick’s giant mutant pickle-powerered energy scheme. Chilly, rainy weather made for a slow start to the day, but by the afternoon the crowds had picked up. The big finale of the Festival featured a battle between Wallace the Robot and Leviatha the Kraken, followed by the Big Nazo Creature Band announcing that they were aliens from outer space intending to invade Waltham. Despite the threatening clouds, the Festival was better attended than the previous year. Our theme this year was "Airships" and we did, indeed, soar higher and more thrilling than ever before! After the Festival, Bob Perry stepped down as Lead Organizer; the new Lead Organizer is Melissa Honig. While the (eventually correct) predictions of rainy weather my have dampened expectations a bit, 2018 was possibly the most enthusiastic, if not the highest attended festival to date. 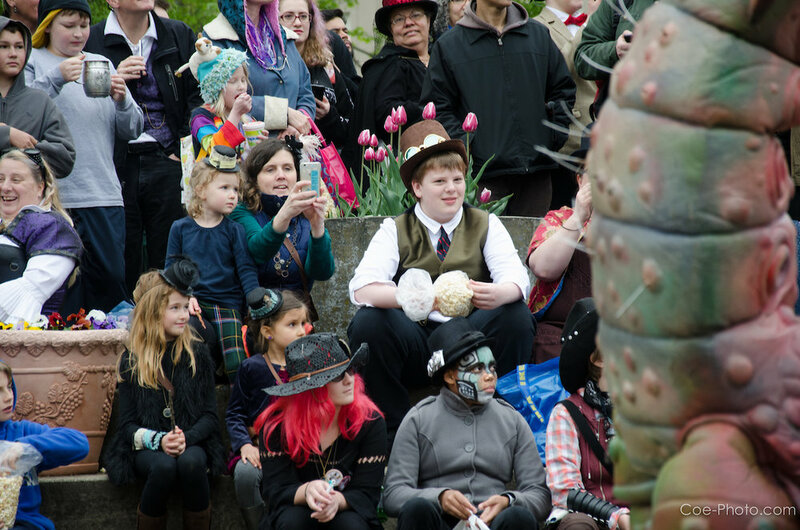 While it may have kept a few folk home, we still welcomed a crowd in the high thousands, with possibly the largest proportion of hard-core, costumed steampunks ever. From vendors, to performers, to attendees, all were defiant that a little weather was NOT going to dampen their fun, even if it dampened everything else just a bit. 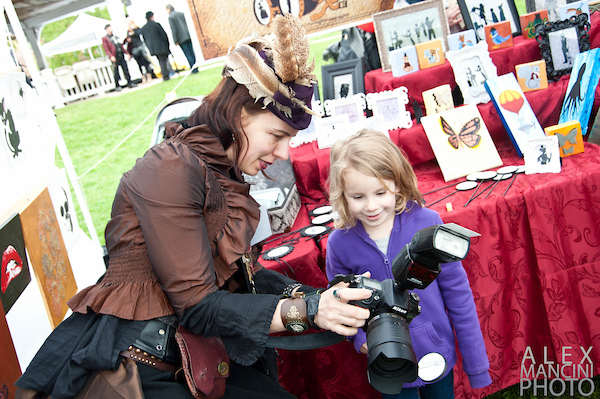 It just goes to show how wonderful the Watch City Steampunk Festival community is! The History of "WATCH CITY"
It all began when the Charles River Mad Scientists’ League, secretly headquartered in the Wayback behind the Charles River Museum of Industry and Innovation, used their newly devised Interdimensional Portal to open a gate between Watch City and an alternate universe doppelganger called Waltham. The event took place on Mother’s Day Weekend because the scientists were trying to impress their mothers with a gift they’d truly never seen before. Ever since then, a great festival has taken place each Mother’s Day Weekend as both cities celebrate this once-a-year merging.